roy thinnes wrote: @Immanuel: thanks for the hint! Please try these modules. Thanks Roy. It is closer. I have to set the CWM filter to 80-81 to hit the 100 Hz cut off frequency and to set it to ~1040 to hit the 1000 Hz cut off frequency. If I may make a wish, I would love to see a 6 dB HP filter too. With the new 2CH Hdlp, I have to set it to ~88-89 Hz to get a 100 Hz X-over frequency and ~1130 Hz to get a 1000 Hz X-over frequency. I've been desperate to try out these new modules, but I've been snowed under the past few days with various things. I promise to give them a go over the weekend and expect to be back with glowing praise. They sure look the part. HOT HOT HOT love you and it makes modular so FAT!!! - a fantastic ramp-swichable-button with controllable min/max-value and impulse/hold-modus+"length" and "smooth"
Last edited by Spielraum on Wed May 21, 2014 10:34 am, edited 2 times in total. Huge thanks to Will without whom this wouldn't have been possible. Waow ! The delay looks very nice ... but it ask a Host stat VC 100 dsp missing file..
and the tempo256kDelay in the zip doesn't ask any dsp file..? Sorry, I forgot that without Will's dll file the module isn't usable. But JoPo...(going a bit OT now) - what is that crazy stuff youre releasing on Soundcloud? Darn! This is far beyond that stuff I usually hear on SoundCl - excellent stuff..
ps. JoPo, the tempo delay included in the zip file is an elder version w/o SR and Ulli compensation. No probs with sharing the HostStats dll... go ahead (I'd share it myself, but I think you're using the version that Simon built)! ok thanks Will & Simon! 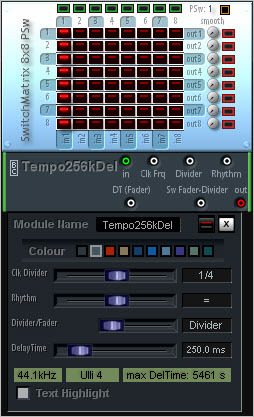 It is now included in the TempoDelay zip file. Last edited by roy thinnes on Mon May 19, 2014 8:37 am, edited 1 time in total. roy thinnes wrote: But JoPo...(going a bit OT now) - what is that crazy stuff youre releasing on Soundcloud? Wow ! Thanks a lot ! Very nice to read ! ... ... Hum ... For 'OT' , what does it mean ? w_ellis wrote: No probs with sharing the HostStats dll... go ahead (I'd share it myself, but I think you're using the version that Simon compiled)! I can't take any credit for the HostStats module other than as a tester / consultant. There have been a number of developers involved in getting it to this stage and it's great to see the results of us all putting our heads together, but it has to be said that Will's done all the hard work on this dll. 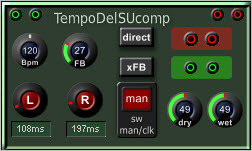 Some tempo delay like this one with i/o for filter choice in the feedback path would be awesome ! Rooah ! Excellent ! Stupendo ! Thanks, Roy ! It's brilliant ! I try it right now ! ohhh, very nice ...danke roy!